Dog training collar is created for large mastiff breeds to be super strong to handle powerful canines in any situation and exercise. This multifunctional mastiff collar is intended for a dog, that is active and included in various fields, such as dog training, K9 service, dog shows, serch and rescue, military, police. This mastiff dog training collar suits for all these fields! 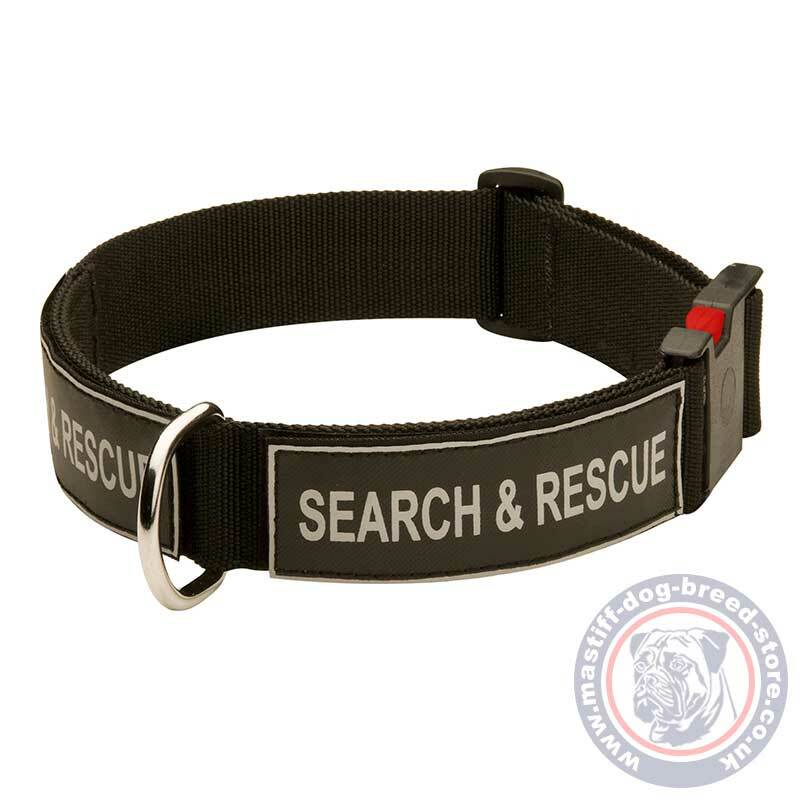 Dog training collar for use on mastiff is made of quality 2 ply nylon, securely stitched and fixed. Nylon dog collar is extremely reliable and unpretentious in use. Take in on your dog in any weather conditions and walk, train, work with your dog without worries. The quality nylon will undergo huge loadings in any weather. Mastiff collar is multifunctional for dog training, service, serch&rescue, dog service, military and police dogs. It has special velcro-adjustable patches with various prints to specify dog activity. The patches are adjustable. It is easy to take a dog training collar on/off by a simple click at the button at the plastic buckle. It combines easy use and reliable fixation. 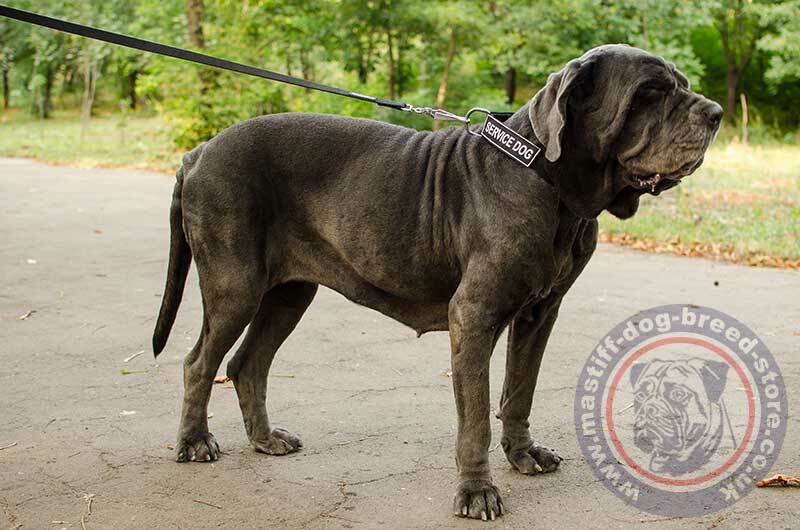 Mastiff collar size is regulated within dog collar limits. Choose the size of dog's neck within the definite limits noted at the sizes table. Dog training collar made of nylon is extra strong, reliable, waterproof and easy in use. The nylon mastiff collar is cheaper than many leather ones, but nor less functional and quality. The dog training collar is equipped with special quick release buckle. The process of taking the collar on the dog is quick and simple! Just fix dog collar length once with special plastic clip to fit your dog maximum comfortably and take the dog collar on with just one click on the quick release buckle. Wide dog collar of super strong nylon will make control over your dog efficient. Strong nylon and cast D-ring are your helpers for calm dog walking and obedience of your powerful pet. The adjustable patches will identify your dog as a working dog, a dog in training, service dog, K9 dog etc. Choose the patches you require from the list. 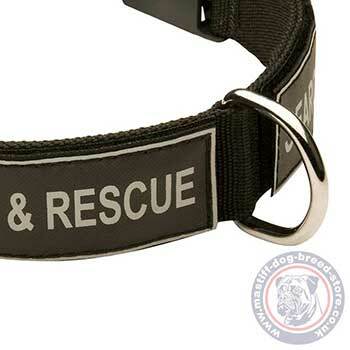 Dog training collar is available with the following patches: In Training, Search & Rescue, Police - K9, Service Dog, Security, Military - K9, Customs, Sheriff, Therapy Dog, blank patches. Mastiff breeds are the largest dogs with a great power. They are perfect service dogs and family friends. Train your dog efficiently as a service dog or as a devoted friend and it will pay back with loyalty and great amount of positive emotions. Mastiff breeds are very friendly. But sometimes they are even not aware of their power. As a responsible dog handler of a powerful pet, you should be always ready to control your strong dog. Choose quality dog gear, that will keep your powerful mastiff under reliable control. This nylon mastiff collar is extremely strong and will help you to handle mastiff temperament in any situation.